Air Mauritius is celebrating its 50th anniversary with a series of commemorative events around in the world. In Mauritius employees gathered at office locations at Port-Louis, Ebene, and SSR Airport to celebrate 50 years of the glorious history of the company. All three ceremonies were attended by chairman, Arjoon Suddhoo and the officer in charge, Raja Buton. Wishing a very happy anniversary to all, Suddhoo paid tribute to all the pioneers, partners and the various governments who have participated in making the history of the company. He encouraged all to let the pioneering spirit which created Air Mauritius to prevail and to build the future of the company. Buton, in turn, tanked all employees for their valuable contributions. He highlighted the major investments that the company will be making to secure its future. At the same time, Mauritius Post launched a special commemorative cover to celebrate the occasion. The launch was held at the Air Mauritius head office in the presence of chairman Suddhoo, with Mauritius Post chairperson Gaitree Usha Brijmohun, Mauritius Post chief executive Giandev Moteea, and a host of senior officials from both organisations also on hand. Air Mauritius has a tradition of holding such philatelic events to commemorate its key historical milestones. On September 13th, 1973, it issued a first flight cover on the occasion of its first Piper Navajo flight to Rodrigues. It also issued a first-day cover to commemorate its first international flight on October 31st, 1977, a first-day cover to celebrate its 25th anniversary and two further commemorative covers on the occasion of the launch of operations to Zurich and to Geneva. On-board, Air Mauritius offered a treat to all passengers travelling on flights out of Mauritius. Chocolates, treats and champagne were offered on-board and a lucky draw was conducted before each flight. Passengers won free tickets to the destination and in their original class of travel. The prizes were awarded on-board prior to flight departures. 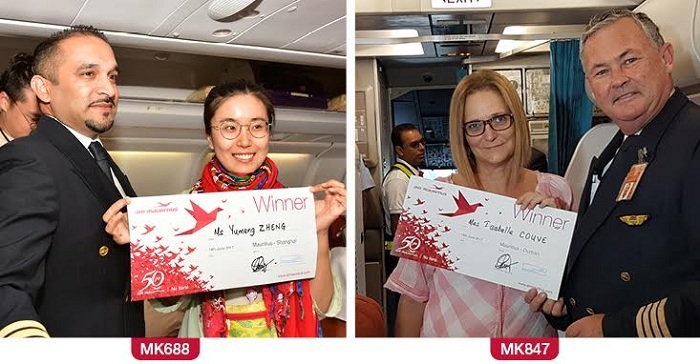 A special announcement was made on the flights and the prize tickets were remitted to the winners by the captains of the respective flights. Air Mauritius was founded on June 14th, 1967.